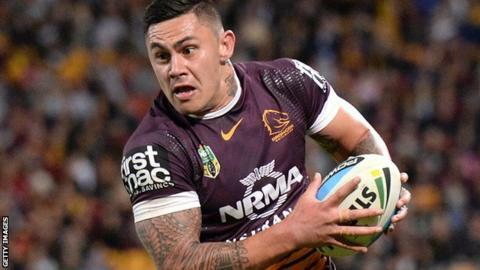 Super League side Salford Red Devils have signed Samoa utility back Daniel Vidot from Brisbane Broncos on a two-year contract. The 25-year-old, who can play on the wing or at centre, started his career at Canberra Raiders and has also played for St George Illawarra. Vidot is Salford's ninth new signing for the 2016 season. "Daniel will bring top-class experience to us," head coach Ian Watson told the club website. "He is used to a winning environment and his enthusiasm and keenness to get over with his new team have been great to see." Read more on Doping scandal: Can athletics learn from baseball & cycling?